This is a whole lot of Giz, many thousands of them, over an acre of beautiful baits. They were certainly catchable with the right net. 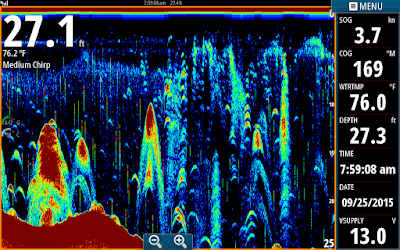 Side scan discriminates better and shows each individual bait and its size better than the sonar does. You could also change your page to use side and down scan to see more clearly. "This is Kevin. I was catching bait during the day this weekend and it wasn’t easy. I used popcorn to mark the spot and it worked after about four tries on Saturday. I had 95 blue back herring and I was on top of the world! But it was a lot tougher on Sunday. I thought, if the bait was in the center of the screen, they would be directly under the transducer. Is that true? If not where are they in relation to the screen? I looked at your last post and it seems to indicate that they are more at the front of the screen going left to right. After about twenty tries; I had 75 baits, but I didn’t know why it was so hard. I went up stream to see if I could find bigger bait balls. “I should have went fishing, but I wanted to learn about catching bait in the day.” At one point my whole screen was yellow. How could I not catch bait: I wondered? I was on med chrip about 85 color line and maybe 55 sensitivity. I know I need to pay more attention when I am catching at night, but I do remember seeing patches of red when using the lights to catch bait at night. It gets confusing because I am experimenting with my new sonar and chirp. Should I not be looking for yellow when looking for bait?
" Hey Jim, can you post photos of the baits? I.E. gizzards large and small, blue-back, threadfin, alewife, etc. Would be a great add to your sonar shots. Joy . " These are two emails I received from from my clients, journal followers turned friends this week. 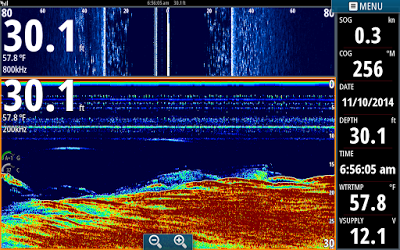 I can interpret what I see on a Lowrance or Simrad due to the many thousands of hours I have spent on the water using my electronics to locate and catch bait and fish. 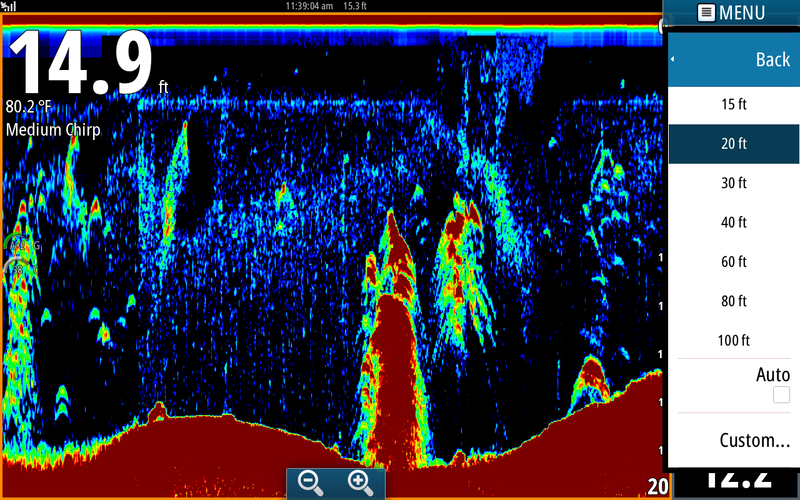 I know what almost every mark is on a screen due to the fact that over time when I see bait I throw a cast net and catch the bait and recognize the sonar signature that is on the screen. The same with fish arches. I will put baits in the fishes faces and catch the fish then store the screen shot in my memory. I will then relate my experience to future views on the screen to determine what bait I am looking at or what kind of fish are below the boat. I refine my thoughts to is the bait worth throwing on [correct type and is it actually catchable] or are the fish I am seeing the kind of fish I want to catch , the size I want to catch and are they feeding and worth the time to stop and put baits out on them. The bait in this lake school. You can look for miles sometimes wondering if your depth finder is working then trip over schools [usually clouds] of bait. Once I find the bait I determine what kind of bait they are [by the configuration of the cloud and size of tiny specks or arches on the sonar screen or the size of the vertical dashes on side scan]. I will only throw if I think the bait is dense enough to catch in my net at whatever depth they are at. I determine that by the density of the bait school. the more color in the school the more the bait is congregated and obviously more catchable. Regarding setting upon catchable fish, I look for numerous arches again with plenty of color in the arch along with the size of the arch. Once I find them I look for how they are relating to the bottom or what part of the water column they are in. Then I want to see them moving, not just suspending. Feeding fish will have streaking arches on the screen depicting them swimming trying to catch bait. You usually will see streaking on your screen. Non feeding fish usually are bunches of perfectly drawn arches under the boat simply hanging out. I also want to see tall vertical dashes on my side scan with shadows behind them. The larger the dash and bigger the shadow the bigger the fish. 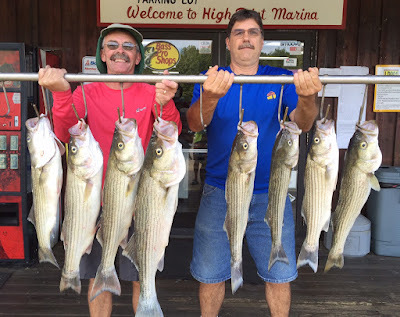 I will visit locating and catching Stripers in another posting. I want to answer some questions here on catching bait. Kevin is a dedicated Striper fisherman that has no problem catching bait under lights at night but needs to catch daytime bait as well. When bait is plentiful just about anyone can do it, but those times are few on this lake. Catching daytime Herring requires an understanding of where the bait is in relation to the boat and perfect timing to throw the net exactly on top of the bait. I locate bait by running about 20 mph until I see it then note where it was either by a marking it with a waypoint, visualizing it or throwing a peanut or in Kevin's case popcorn. I throw my net off of the front of my boat so I put my trolling motor in the water which has two transducers on it, a sonar and structure scan. I use the big motor to go back to the bait and I usually locate it on side scan before sonar. 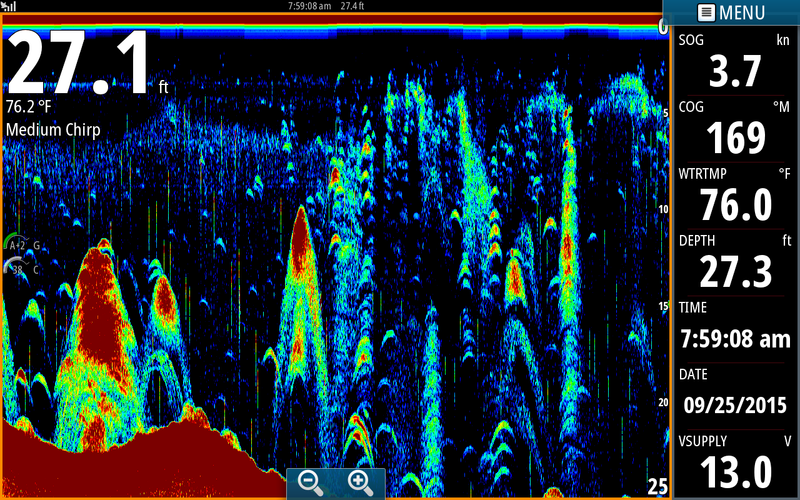 The combination of sonar and side scan is deadly on catching bait. You can determine exactly where the bait is. 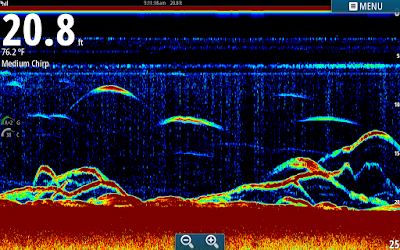 Back to the questions: The sonar screen scrolls from right to left. What is happening right now [directly underneath the transducer] is on the extreme right side of the screen. As the screen moves to the left it become history. Depending on the direction you are traveling and your speed what shows up in the middle of the screen could be 20 to 30 yards behind you. You can determine exactly how far back it is by touching the school on your screen and looking at a box that appears showing you how far it is from your current location. You could also waypoint it if you wish. The settings on your unit help with density of the school. Depending on the palette you are on, more or brighter color represents density. Kevin your color may be set a little too high. Also depending on your depth your sensitivity may have also been to high and displayed a more aggressive screen. Maybe try auto sensitivity and color line for awhile. It is great that you are experimenting but use your side scan as well to see what side of the boat the majority of bait is and exactly how far it is. Use an educated decision in throwing the net over top of them and your results may be better. Don't get frustrated in not catching daytime bait with regularity, sometimes it takes me hours to locate and catch it. If the water is clear the the bait is deep, it is tough! I will be happy to help anglers with questions about Navico products. Screen shots and settings help me determine what you are asking about. Don't worry about me posting them, I am using this post just to let you know I am out here and maybe can help. My email is jim_hemby@hotmail.com, or you can comment me on my journal or facebook me. These are a few scattered Stripers on a 25 foot flat with some catfish mixed in. Many of my clients want to understand how I know how large a fish is by looking at my unit. Sonar works kind of like a small pen-like flashlight. If you were to shine the light straight down the cone angle is very tight near the light [or transducer] then spreads outward the deeper it gets. The closer the object is to the center of the cone, the better the reflection will be. The fish at 8 feet on the left of the screen is directly in the center of the cone. It shows almost a perfect arch and has some color in the core of the fish. The fish at 12 feet just to the right of the first fish is off slightly to the side of the center of the cone. It is more flat in nature and barely has any color in it. Then the yellow flat signature to the right of it is on the outer edge of the cone angle, displaying no color. The size of the fish are relative to how far the fish is from the transducer. The fish at 8 feet appears to be nice but it is only 8 feet from the transducer. The closer it is to the transducer the bigger it appears. It may have been a 1 pound fish. Now if that same fish was in 24 feet, the arch would have been about a third of that size. Consequently in determining how large a fish is you must take into consideration how far it is from the transducer. The Stripers on the screen were probably 2 to 4 pound fish. This is a brushpile with crappie holding on top of the brush and next to the brush. You can see tiny arches on the left side of the brush, on top of it and a suspending school just to the right of the brush. You can tell that it is brush because it is connect to the bottom. If it were bait for example the fine yellowish line that is the surface of the bottom would come underneath the object just like it does underneath or the two catfish laying near the bottom. I took this shot while looking for Stripers. There was about 3 to 4 acres of bait that I was searching to see if there were any Stripers that might be feeding. I looked for about 10 minutes but all I could find was bait. The small vertical arches that are stacked vertically are white perch. The school of bait on the left side of the screen is 4 to 5 inch Gizzards and the small school near the middle of the screen is Threadfin shad. Threadfins always look kind of like a rocket ship, they have a point on the top of the school, very dense center then have two downward "tails" underneath the school. The way I know what they are is that I have been throwing cast nets on bait for the last 25 years and I recognize the correlation of what I catch in the net to the shape and size of what I see on my depth finder. When I target specific types of bait I throw only on what I know to be what I want. That 10 foot 1 1/2 pound net gets heavy after 20 to 30 throws! Today's charter was a fun morning spent with two couples from Pennsylvania. We started the morning off by pulling boards and running downlines checking out flats and points from 5 to 25 feet deep. Today's fish were caught in "places". We never located any schooling fish today. We had just enough action to keep everyone happy and plenty of fillets to take home for the table. Looks like the wind is going to blow out of the Northeast for the next week or so with plenty of rain on its way. Today I wanted to take my boat out and set up my new motor so I called Greg and he said he could get off around lunch time. He came over and we hit the lake around noon and we took the boat for a ride. I had water in my bait tanks so I could prop the boat out properly and we decided to catch some bait and fish for a hour or so. I did not see any bait main lake so we ran into the back of a creek and caught about 120 baits. We hit one place and popped two in ten minutes but we released them. We made a short move and set up on a 100 yard stretch. Five minutes after getting our baits in the water we had a deck full of Stripers. We rebaited our lines, counted the fish and needed 2 more for a limit. Before we knew it Greg had boated 2 more Stripers and we were done. He threw those fish in the box and before we could get our other 8 lines up we hooked up numerous times and released those fish. Not bad for an hour of fishing! I have been off the water for about 2 weeks now with the exception of breaking my motor in a couple hours last week. The reason Greg is smiling so much is that the big fish he caught is 34 inches long. Carlos is in the picture because he just wanted to see what it was like to hold up a stringer of fish....I should have made him hold them up for 10 to 15 seconds like he sometimes does my clients but I couldn't do that to him.